Send and receive photos, notes, contacts, documents, and tasks between your iPhone, iPod Touch, and Mac. It’s Quick. It’s Slick. It’s Fliq! The Mac version of the popular social networking iPhone app Fliq makes it easy for Mac users to send and receive photos, notes, contacts, tasks, and virtually any type of document like never before. Exchange and share files over a network with others on Macs, Windows PCs, iPhones and iPod touch faster than email and texting. Fliq to quickly send a contact to someone. Fliq lets you send notes, memos and just about any text on your Mac. to Fliq – lots of ways to send notes and text, fast. search and categorize your notes however you wish. photo or image and drag and drop it on a contact to send it. Select a note, memo or any text from your Mac and then fliq it to anyone on your network. Share any document, spreadsheet, pdf, presentation, even music, videos, and photos. Locate in Finder and just fliq it. your own contact information with details you choose. Click to Developer’s Site for more info Fliq for Mac. of paper that could get lost. information is as easy as a tap, click, or a drag-n-drop. No complex setup or configuration. and easy ways to share your contacts, photos, notes, tasks, and virtually any type of document with others over a Wi-Fi network. else there is a shared network. The Missing Sync for iPhone works hand-in-hand with the iPhone apps, Fliq Notes, Fliq Docs and Fliq Tasks to sync your notes, documents and todos and keeps them the same between your iPhone or iPod touch and Mac. Archive text messages and call history to your Mac or PC so you can do more with them. And, easily migrate contacts, calendars and more from your old phone to iPhone. Free upgrade for all version 1 owners. Sony, Sony Ericsson and others. 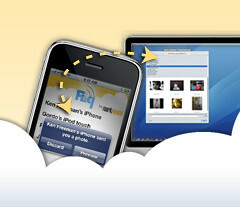 Remotely send commands and retrieve files from a Mac via iPhone and iPod Touch! WiFiServer is a server application installed onto your Mac as a preference pane. The combination of WiFiServer and WiFiControl (the free iPhone / iPod Touch app from Modesitt Software) allows iPhone and iPod Touch devices to remotely send commands and retrieve files from the Mac. WiFiControl is available from the App Store FREE. - Send commands to the Mac such as shutdown, sleep, logout, restart, as well as send a text message. - Messages sent can appear in a window, heard as synthesized voice, or both. - Execute the commands immediately, or set a time when the commands should execute. - Cancel commands set for a future execution. - Quickly search and retrieve files from the Mac using Spotlight. Files are saved on the mobile device. All from your iPhone or iPod Touch using WiFi. More file types will be added in later releases of WiFiControl. - You have a child that likes using the Mac, a lot. Sometimes too much. It’s dinner time in 15 minutes. First you send the Mac a message stating “Dinner in 15 minutes. The Mac shuts down in 10.” Then you send a shutdown command to execute in 10 minutes. 15 minutes later child shows up for dinner. - There’s an Excel file on your Mac you want to bring with you to a meeting, but you don’t want to lug your Mac around. Instead you copy it to your iPhone using WiFiControl, and view the file on your iPhone while at the meeting. You get the contract. - There’s an important lunch at noon, and you don’t want to forget. You set WiFiControl to send yourself a message at 11:45. Lunch was good. - You’re at a co-workers office, longer than you thought, and you forgot to log out of your Mac. No need to run back to your office and log out. Instead use WiFiControl. Co-worker is impressed. To be clear – WiFiControl requires WiFiServer to function. Today, we are selling WiFiServer for 40% off. Click to see the Installation Guide for WiFi Server. WiFiServer for Mac requires a Mac running OS 10.5 or greater. Connection requires a WiFi connection, and a compatible client application on an iPhone or iPod Touch. Web2 Delight is an entertainment tool to carry your favorite videos/ photos on your iPods & iPhones; watch them on-the-fly or on your big screen. Web2 Delight allows you to locate, view and transfer your favorite videos from YouTube, Dailymotion, Veoh, blip.tv and photos from Flickr, Picasa, Webshots and Photobucket. Note: Web2 Delight is intended to be used as a personal entertainment tool only. Please respect the rights of the copyright holders of any material you download. Voila – An image capturing, annotating and sharing tool. Our other product that you would be interested in. Try it. Start saving your audio conversation from Skype! Record it now. Listen to it later. Save it forever. SkypeCap for Mac captures and records audio calls made from Skype. Recorded calls are saved as MP4 files, to be replayed, shared, archived, or studied. SkypeCap is valuable for business, a practical tool for everyday and very easy to use. Wouldnâ€™t you love to stop time and take a minute to catch up? Itâ€™s nearly impossible to take notes during a call session and keep up with the conversation. Stay in the conversation and keep the discussion moving when the Skype call is recorded with SkypeCap. Skype calls recorded with SkypeCap can be referenced again and again. Calls are saved in an MP4 format: compact and versatile. Use the saved calls to hone your phone presentation skills. A saved conference call can be distributed to anyone who missed the original call. Sales calls and interviews can be saved and more carefully reviewed later. SkypeCap records your audio Skype calls for you. Itâ€™s so easy now to record your call, listen to it later, and save it forever. SkypeCap for Mac is great for personal and business use. Distribute saved calls to your organization. Use the recorded call as the meeting call report. Record audio Skype calls from far away loved ones. Share recorded calls with family and friends. Playback important calls to get all the details. SkypeCapâ€™s control panel is straightforward and easy to use. Record audio calls automatically or start and stop recording where you like. Change the Sample Rate to improve the audio quality or decrease the file size. Specify an output folder location to keep your recorded calls organized. Use SkypeCap to record your call now! Listen to the file created by SkypeCap later! The future of phones meets the future of learning tools. Offering a uniquely interactive experience, â€œItâ€™s About Time to Learn the iPhone 3Gâ€ is one of the most innovative learning systems ever. When your virtual instructor, Saied, teaches you in a two- to five-minute lesson how to do something on the iPhone 3G, you can instantly try it on the virtual iPhone 3G thatâ€™s built into the tool. So you can rapidly become an expert and use the iPhone 3G to its full potential: From setting it up in iTunes, to using every iPhone 3G app, to mastering helpful tips and tricks. â€œItâ€™s About Time to Learn the iPhone 3Gâ€ also teaches you what you need to know about iTunes to get your iPhone 3G up and running. Whether itâ€™s your music, TV shows, or videos, everything starts with iTunes–the application that syncs all of your media onto your iPhone 3G. iTunes is a great jukebox for your media. Click to http://www.itsabouttimeproducts.com/iPhone_3G/ for more info. Send and receive photos, notes, contacts, and tasks faster than email and texting. The Mac version of the popular social networking iPhone app Fliq makes it easy for Mac users to send and receive photos, notes, contacts, and tasks** like never before. Exchange and share files over a network with others on Macs, Windows PCs, iPhones and iPod touch. Create perfect iPhone wallpaper easily! iMagePhone is an iPhone wallpaper maker for Mac OS X. Crop, resize, zoom and enhance your own image according to exact parameters of the iPhone’s display. With iMagePhone, you can import images from iPhoto and use enhancement tools to customize your image with over 50 photo effects. Then save as iPhone wallpaper and transfer directly to iPhone, email to family and friends, save and organize into Gallery Folders or export into different graphics formats. iMagePhone helps you personalize your iPhone or iPod Touch easily. Preview your background before transferring to iPhone or adding to the wallpapers gallery. Native iPhone support allows uploading backgrounds easily and conveniently. iPhone firmware 1.x, 2.x (both original and jailbroken) are supported. images for better compatibility with iPhone display. You can enhance your photos with over 50 Core Image and Quartz filters: sharpness, brightness, sepia, blur and more. Add fun effects to your images with the latest Reflected Tile and Kaleidoscope filters which are available in Leopard OS X.
folders. Original images can be saved in the gallery for further editing. Located in historic Kyiv Ukraine, Polo Planet Software is a privately funded company founded in 2006 by Vlad Smirnov. Polo Planet’s focus is on multimedia software as well as supporting a wide range of mobile devices, including iPhone/iPod Touch, and new graphics techniques. With a focus on the Mac and iPhone platforms, their specific goal is to develop applications featuring the latest technologies, best graphics design and to bring new and interesting ideas to life. The ZOT before Christmas! Special 1Password Christmas Offer! Know someone new to Mac? Need a gift for someone who â€œhas everythingâ€? Give them the gift of Security and Productivity this year! Simply use the â€œThis is a Giftâ€ option in the online store and provide their email address along with your best wishes. We will handle the wrapping and shipping and deliver them your gift. Fone2Phone – Switch to the iPhone, save your data! Change to the iPhone, but don’t leave your data behind! Scoring a new cell phone, iPod or iPhone is great, but transferring the data from your old cell phone isn’t always as cool of an experience. Thanks to Fone2Phone from nova media, however, that data shuffle is a piece of cake. This one trick pony moves contacts, events, tasks, notes, bookmarks, photos, music and movies from many Motorola, Nokia, Samsung and Sony Ericsson phones to your Mac. The interface is simple and sleek, and makes the whole process a breeze. Activate Bluetooth on your cell phone and Macintosh Computer and launch Fone2Phone. This program will take over and do the work for you: from the connection process to copying all data to your Macintosh Computer. Finally, Fone2Phone will add the new content to your applications: as Address Book group, iCal calendar, iTunes playlist, iTunes movies, iPhoto album, Safari bookmarks and apple Mail notes. Thus it is easy to use iSync, iTunes or FoneLink to transfer your contents to your new device! iSoftPhone – An Amazing Phone in Your Mac! Displays names of Daylite contacts. for help to configure iSoftPhone.